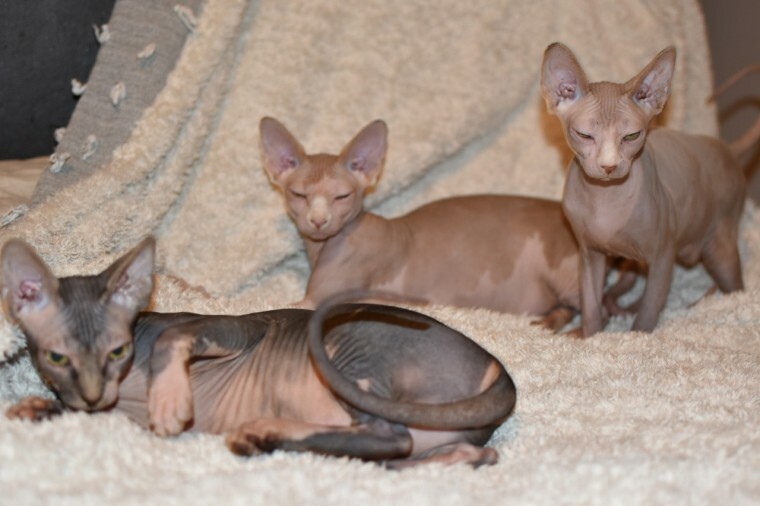 1 Red and Cream Boy 1 Cream Girl 1 Blue and Cream Boy I have 3 beautiful Canadian Sphynx Kittens For Sale. These colours are very unique. Parents are GCCF registered and paperwork can be seen. These kittens have been to the veterinary hospital for several check ups including the respiratory triple swob. All came back negative. They are all litter trained and very playful. They are up to date with worming. They are used to bathing and having there nails clipped. They are all fed on a raw diet only. They can come with 4 weeks free insurance. These are being sold as pet only. but to the right owners I can GCCF register these and get 5 years generation certificate at a higher price. All 3 baby..s have been around young children. dogs and other cats. They are very outgoing and loving kittens. Parents can be seen and viewings are welcome. If you have any questions dont hesitate to contact me. Thank You.